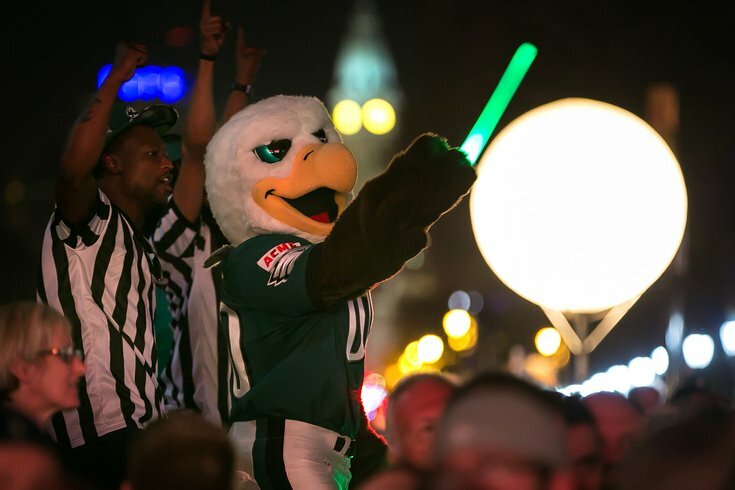 Swoop cheering on the crowd during the 2017 NFL Draft in Philadelphia. Following a start to the offseason that saw the Eagles address some of their most glaring needs, whether through free agency or in the NFL Draft, some fans in the area are starting to believe the team that finished 7-9 last year can make the playoffs in Season Two of Carson Wentz and Doug Pederson. But a lot can happen between now and when the 2017 season kicks off in September – don't forget how much changed for the Eagles in just a single week leading up to last year's opener – and even more can happen between September and February. But that won't stop us from wondering whether or not the Birds have a chance to play in the postseason for the first time since the 2013 season. For Philly fans, however, it might be time to slow your roll. According to Bovada, the Eagles are tied with the Redskins, Dolphins, and Bengals at 50/1 to win Super Bowl LII. Only nine teams, including the Browns and 49ers with the longest odds (200/1), have worse odds than the Eagles. As you can see, the Eagles' odds at Bovada have remained the same throughout the offseason. However, two other sports books had the Birds with better odds prior to the NFL Draft. The day after Super Bowl LI, the Eagles were at +4200 (or 42-1) according to OddsShark.com, placing them 18th in the NFL. Then, prior to the Draft but after free agency calmed down and the schedule was released, a different oddsmaker, bookmaker.eu, had the Eagles at +3581 (or about 36-1).